With Green Lantern set to make it's feature film debut in less than two months, you'll see a lot of the Hive's focus turn to all things emerald. Today I'm taking a look at somewhat infamous member of the Green Lantern Corps. He hasn't been seen in several years, but I have a feeling he'll be back eventually and ready to team with his longtime buddy, Guy Gardner. He's the dog-faced GL: it's G'Nort! What can I say about professional wrestling in the 1980's that I haven't said before? It was a wild and wacky and boatloads better than it is today. Memorable feuds and characters that really stood out from one another. 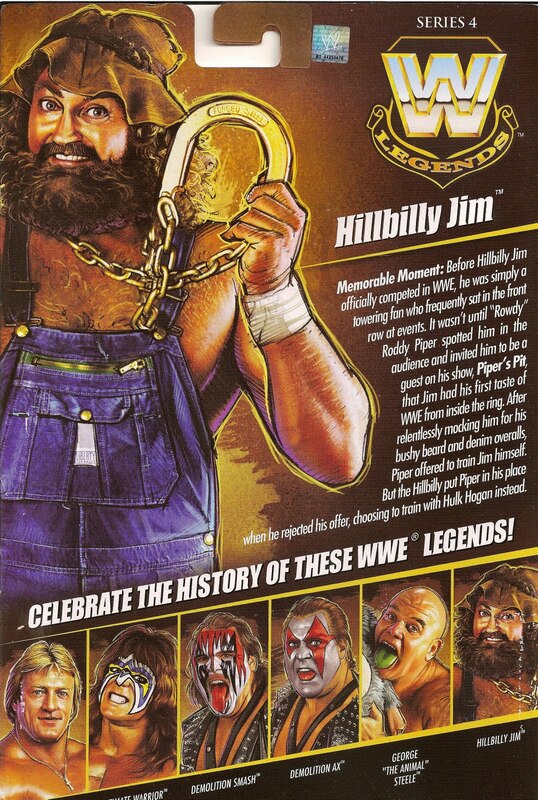 Further proving that the 1980's had no shortage of gimmicky, fun characters, here's Hillbilly Jim who was billed as a hillbilly from Mud Lick, KY. Here's a look at his first release in Mattel's historical WWE Legends line. I hope you can excuse my brief hiatus, I've had "custom-fever" for the past couple of months, working mostly on GL-related customs (because we all know there aren't enough GL figures coming soon...). Anyhoo, I'm taking a break from Frankensteining and painting action figure parts to bring you today's review. He is "The Animal", Batista!